Original shawl designs by Lisa Mutch of Northbound Knitting. 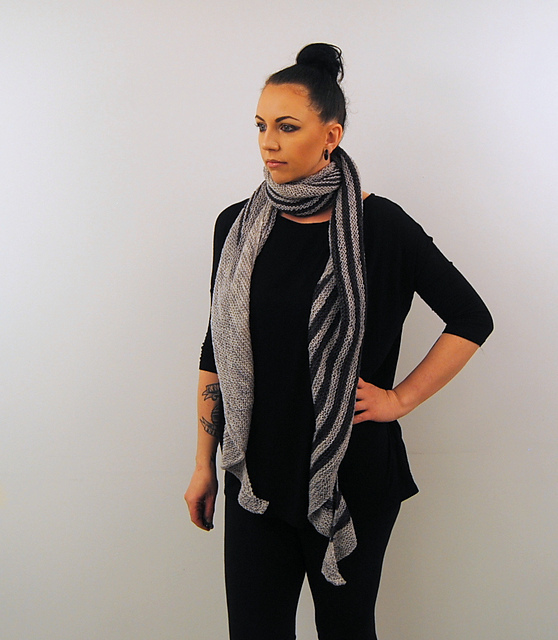 With stripes, curves, points and dramatic flair, this large 3 colour shawl is a great addition to any wardrobe. Angled short row sections and mesh-like lace make this oversized, semi circular shawl dramatic and luxurious. Textures of garter stitch, short rows and dropped stitches, shine through in this structured, yet drapey, merino silk dk shawl. 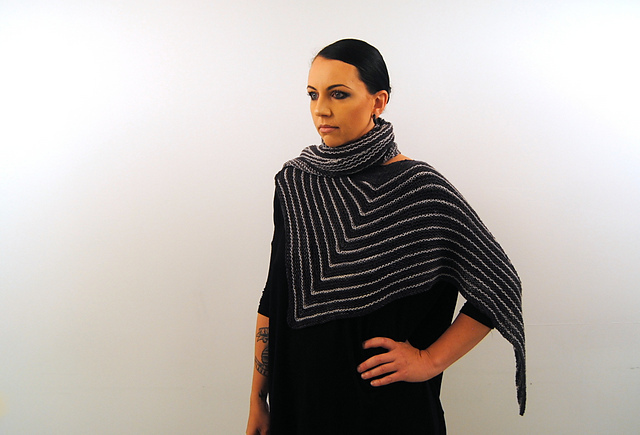 This bottom-up triangular shawl uses short rows and contrasting stripes to create an edgy, geometric design. A modern take on a semi circular shawl, Aile uses 2 colours of luxurious hand dyed yarn to create strategic blocks of solid garter stitch against a wispy net of dropped stitch stripes. 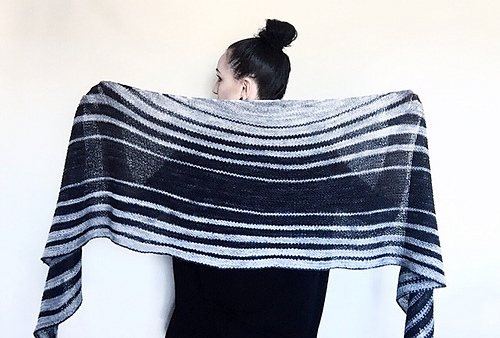 With stripes, colour changes, and short rows, this geometric shawl is unique and fun to knit. A simple garter stitch trianglular shawl becomes so much more with a few drop stitch short rows. 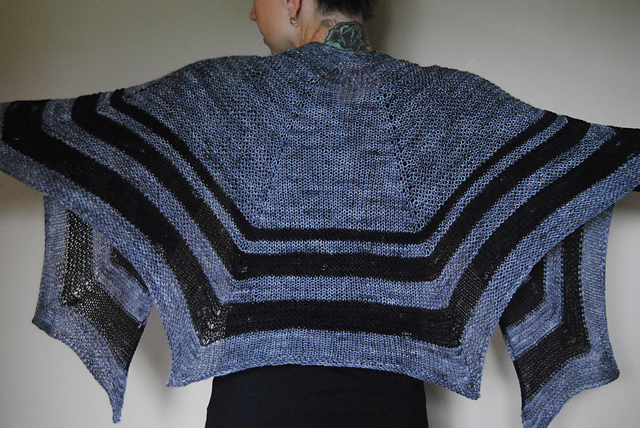 Eyelet sections and a jagged edge let Merino/Silk DK shine in this crescent shaped shawl. Where we’re from, the birds sing a pretty song and there’s always music in the air. 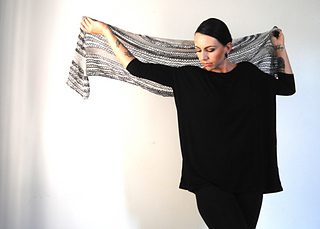 Dropped stitches and short rows give this asymmetrical semi-circular shawl it’s unique shape. 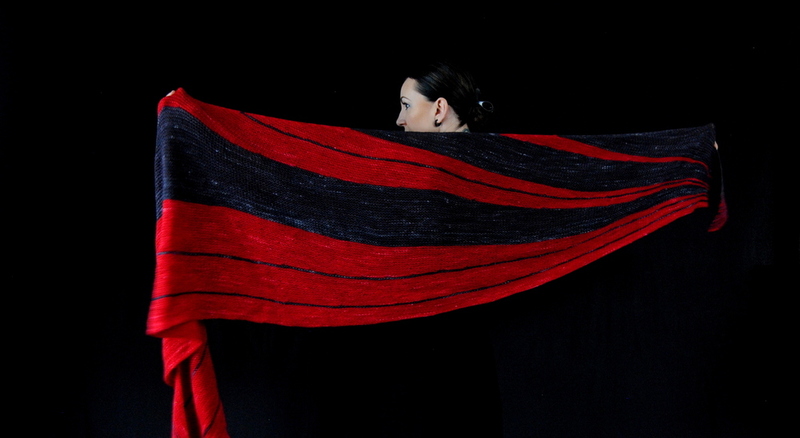 High contrast black and white stripes play within bands of bold red in this classic triangular shawl. Short row wedges, grow and arc across a backdrop of contrasting stripes. 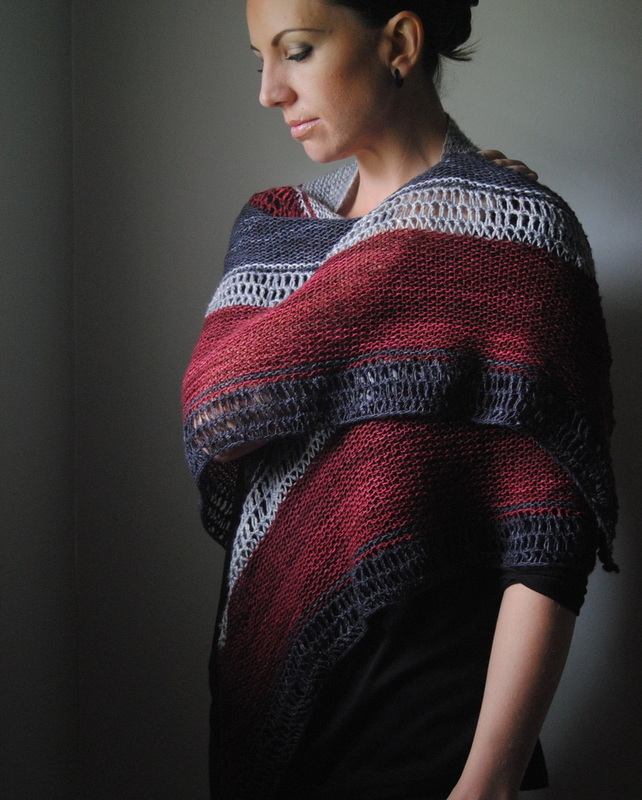 Striped short row inserts give this garter stitch semi-circlular shawl just a touch of flair. Increases and eyelets give this garter stitch shawl it’s sharp edges..
Garter stitch and short row stripes make this fun semi-circular shawl a quick knit and stylish accessory. 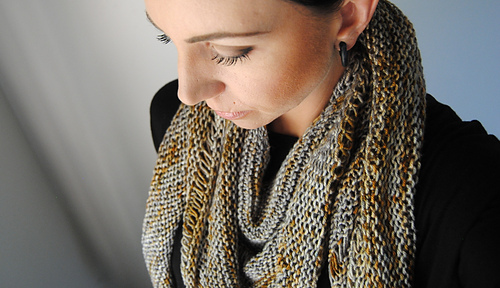 Knit from the bottom point up, with an off center, zig-zagging spine. 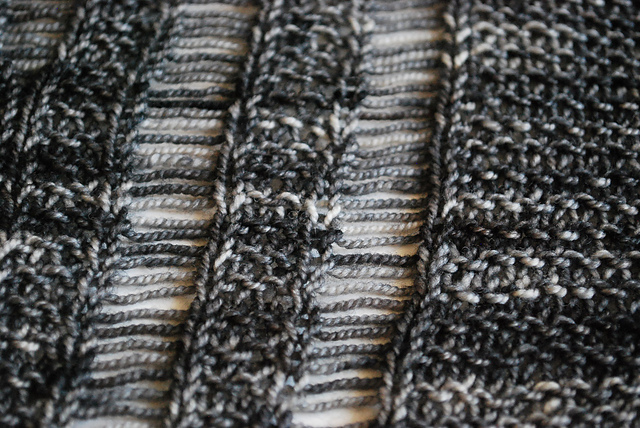 Part garter stitch, part stockinette stitch and a bit asymmetrical. This wide little shawlette likes to deviate from the norm. 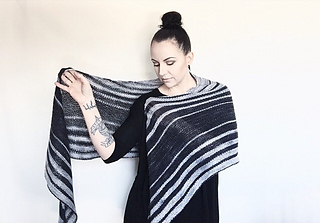 The unique shape of this asymmetrical, striped shawl makes it a fun and interesting knit. Two rebellious stripes gone rogue make this crescent shaped, striped shawl stand out from the crowd. 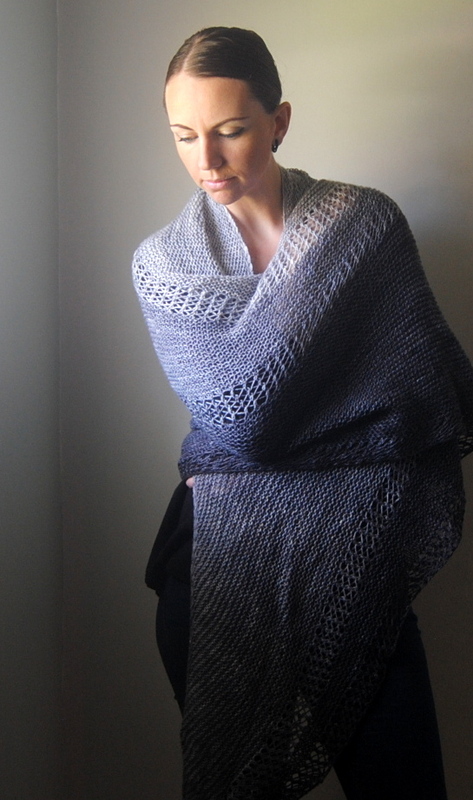 Another great shawl for summer; weightless and drapey, light and airy. Stripes spark out from each other, in an almost electrical current type of way. 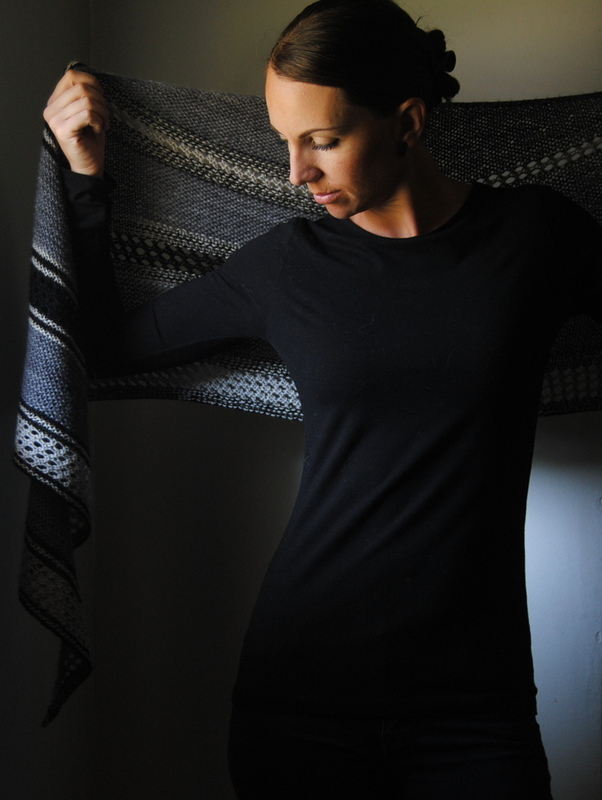 Light and airy, yet able to wrap completely around you, Enshroud is surprisingly quick to knit and can be worn in so many ways. Eris is angular, oversized, drapey and dramatic. Created with short row shaping and three colours, this extra wide shawl can be so many different things, depending on her mood. 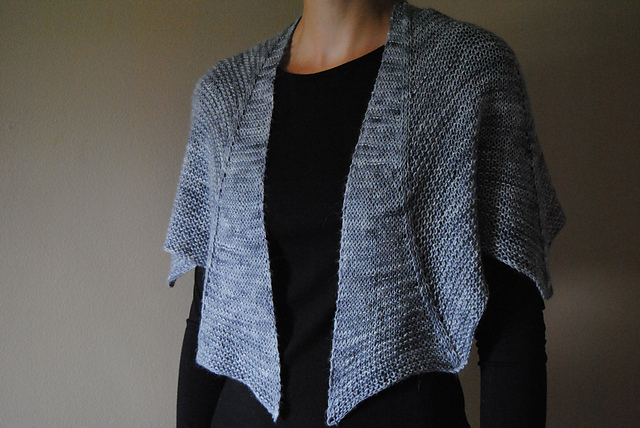 Dropped stitches and short row shaping add extra flair to this extra long garter stitch shawl. 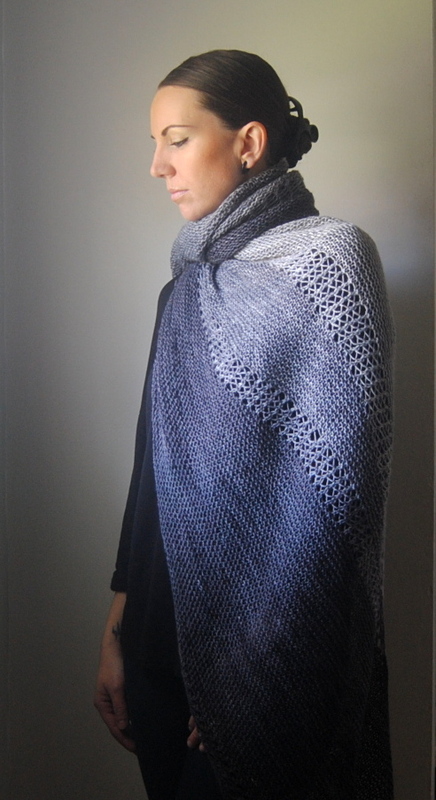 A sharp, jagged edge, fading into darkness, give this shawl its unique shape. 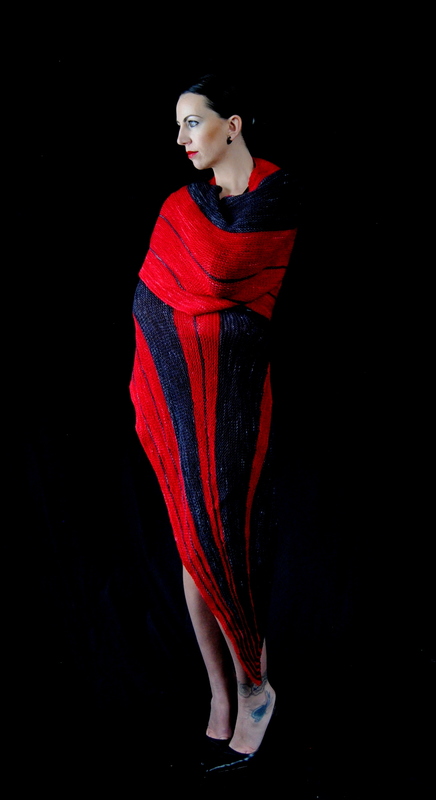 After Midnight, Fiery stripes build in intensity across the pendulous edge of this semicircular shawl. 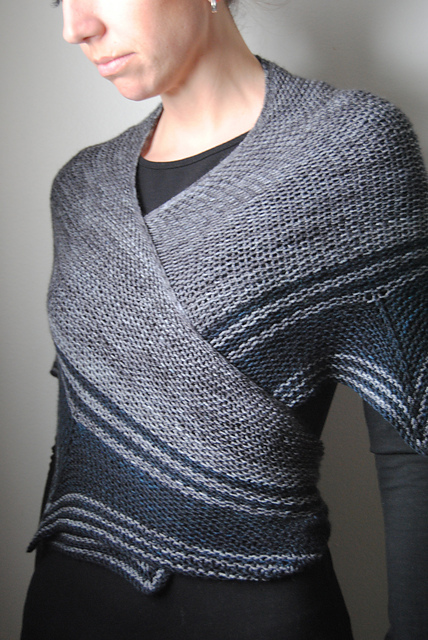 This garter stitch shawl is knit from the bottom point, up and out. A few simple dropped stitches and a bit of asymmetry make it unique. 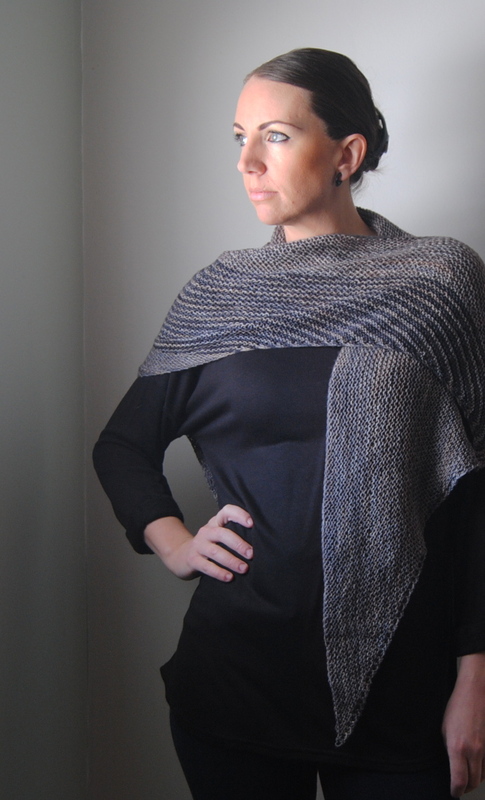 Short row shaping and generous eyelets allow Merino/Silk DK to gleam in this simple design. The dreaded dropped stitch, fatal flaw. 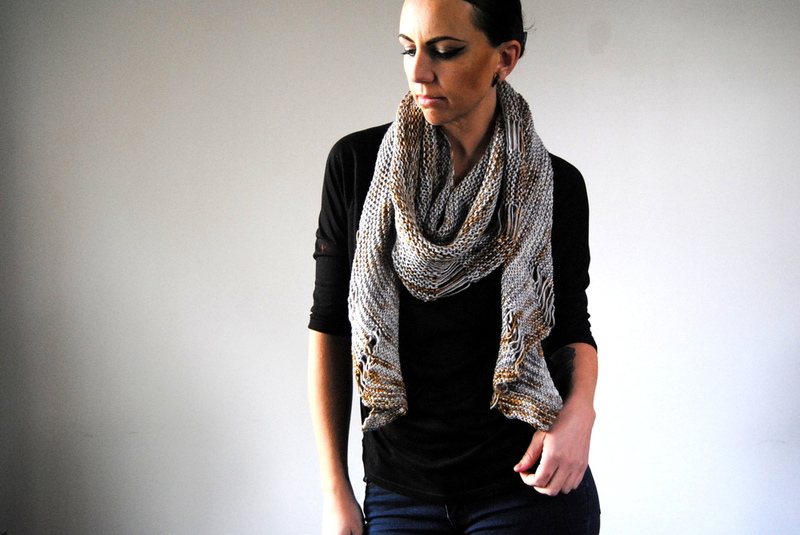 This shawl embraces it, accepts it, utilizes the beauty of an intentional error. Knit from the bottom point up, this jagged little shawl is divided into fragments using short rows and dramatic colours. 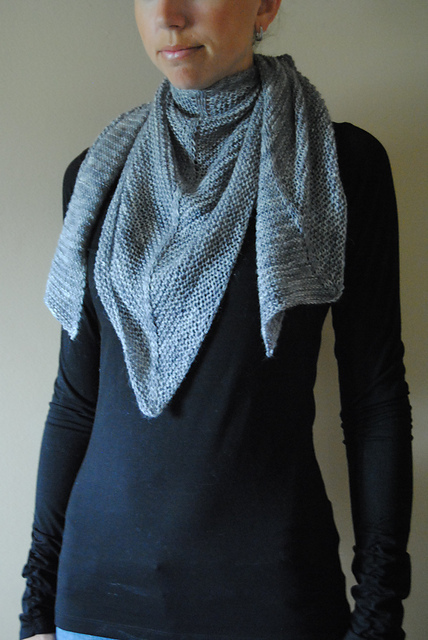 ASimple stitches, large needles, and bulky weight yarn create this hugely stylish statement piece. This asymmetrical, crescent shaped shawl features striped, short row wedges for interesting colour contrast possibilities. 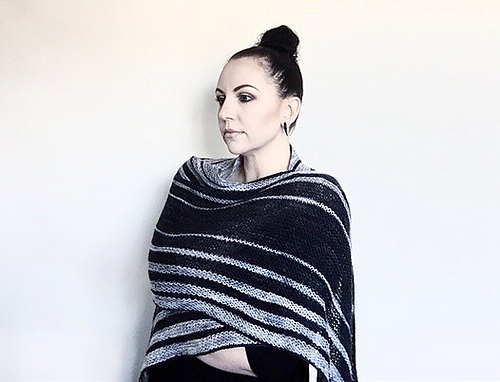 High contrast short row stripes, varying in thickness, make this semi-circular shawl both quick to knit and easy to wear. Simple, stripey shawls are my favourite. Pick two (or three) of your favourite colours and go! 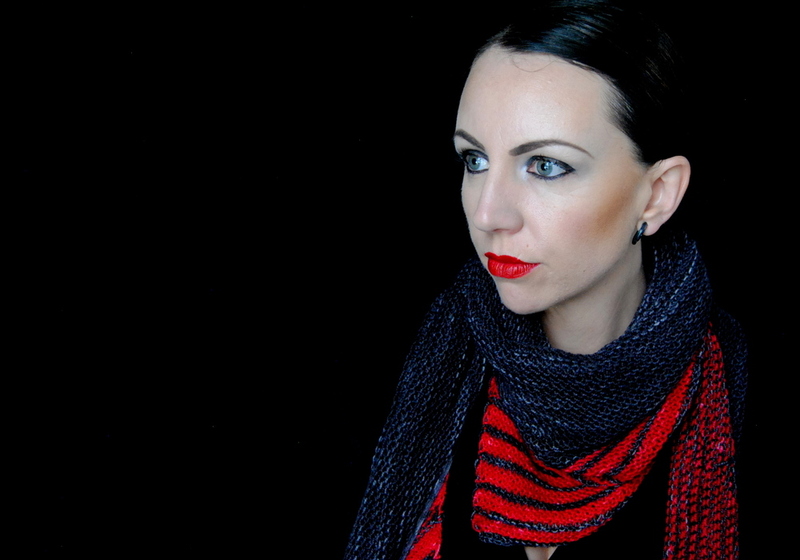 Hypnotic stripes broken up by striking red short row sections make this shawl an alluring accessory. A simple semi-circular shawl becomes so much more with the use of a luxurious handdyed yarn and strategically placed dropped stitches. PDF is available for purchase here. 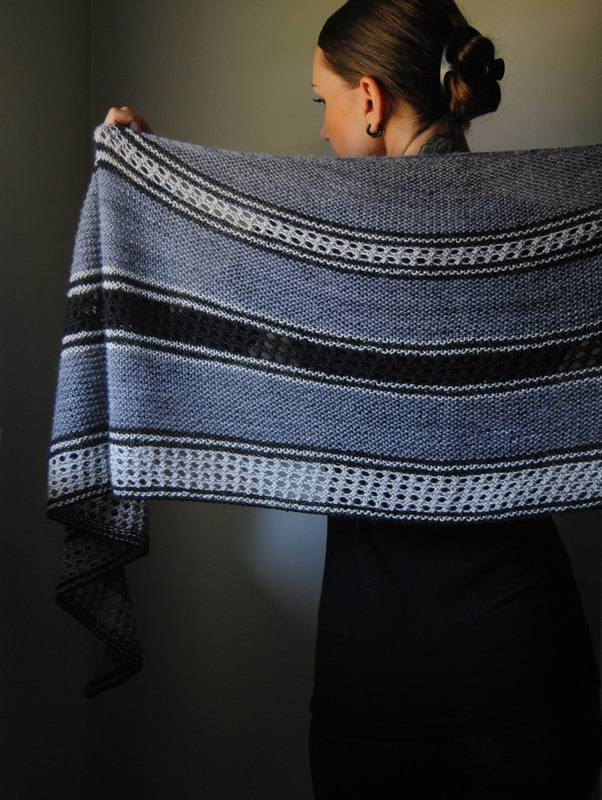 The mother of all shawls, or a really nice, bulky weight triangular blanket. 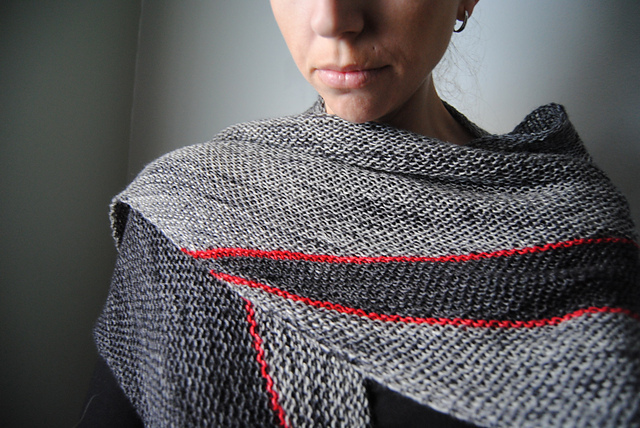 Garter stitch, stripes, and a sharp, jagged edge. This semi-circular shawl can be worn many different ways, and the colour combination choices are endless. Nimbus clouds are heavy, grey, storm clouds. They spread across the sky, hanging low with the weight of the precipitation they hold inside. The unique shape, contrasting colours and varying textures give this shawl it’s dramatic flair. 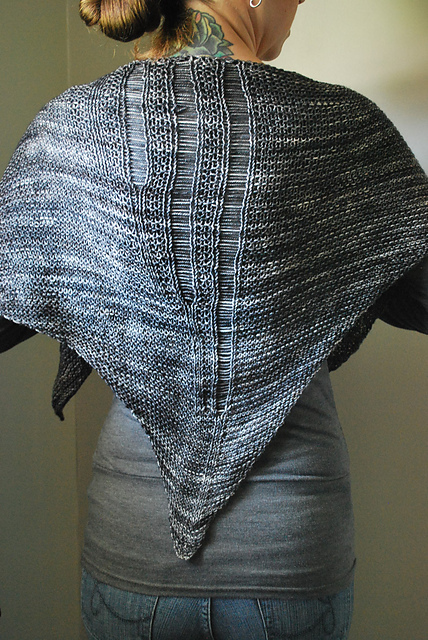 Short rows, contrast stripes, and asymmetrical increase points turn a simple crescent shaped shawl into so much more. 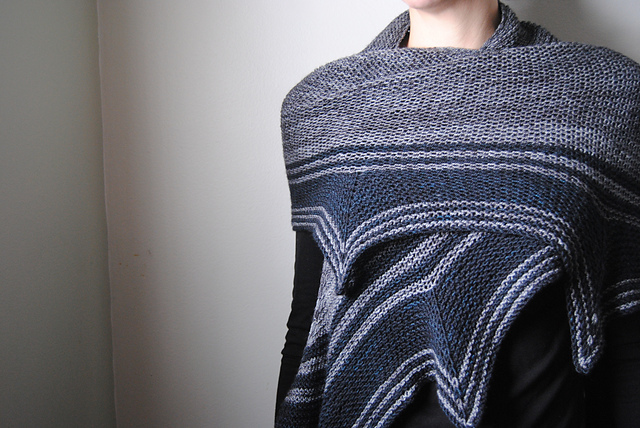 A simple trianglular shawl becomes much more with the help of contrast stripes and short row shaping. 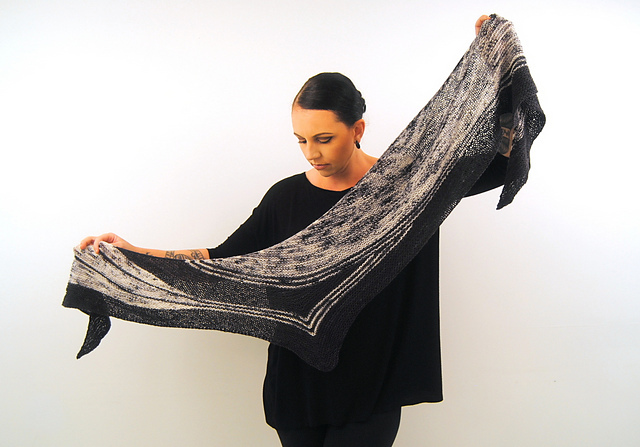 Midnight is swept away by long waves of Fiery short rows in this spectacularly oversized shawl. 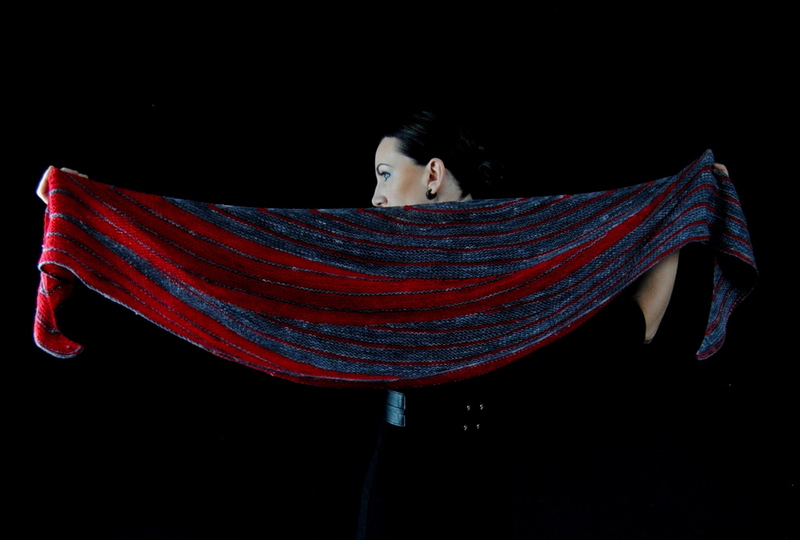 Fiery chases Nocturne, as they race across short-row wedges in this sinuous, semi-circular shawl. 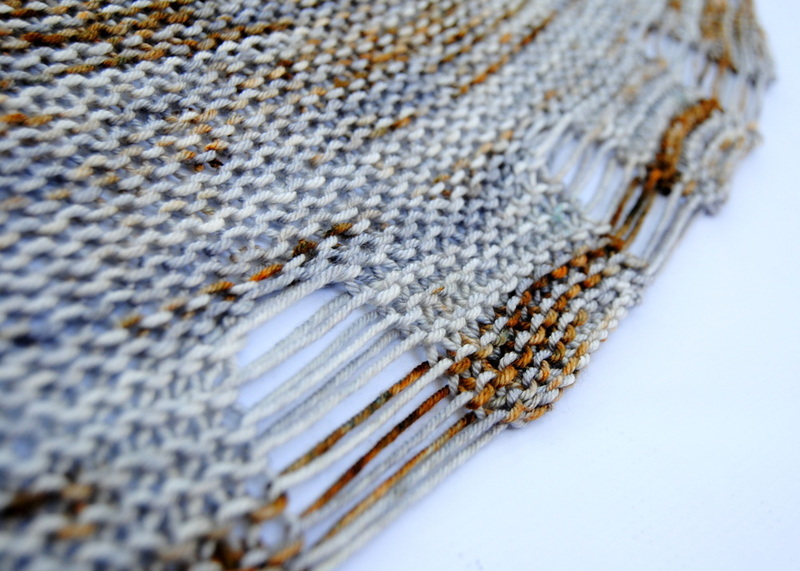 Soft sandy taupes deepen as this generous triangular 5 colour shawl grows. This three panel garter stitch shawl knits up fast in DK weight yarn and features a unique drop stitch edging. 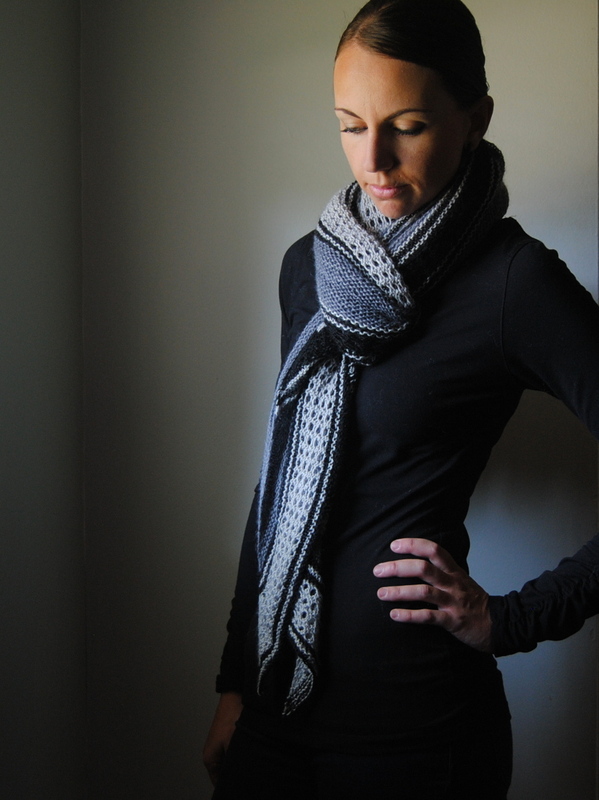 Smoky shades of grey billow out from one another in this long sliver shaped 5 colour shawl. Choose two of your favourite colours to ebb and flow together in this bold semi circular design. A weblike series of garter stitch and drop stitch stripes knit in 2 colours of hand dyed yarn, Toile is a lightweight triangular shawl, perfect for summer and beyond. Garter stitch, broken stripes, luxurious hand dyed yarn. 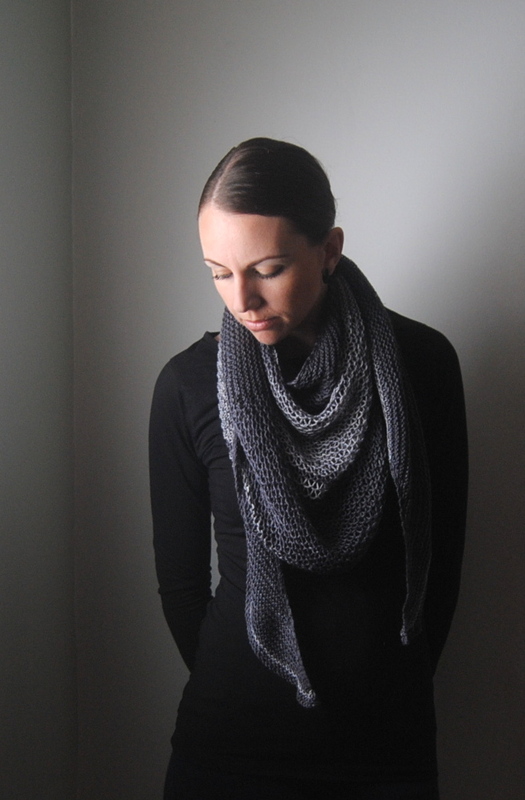 Torrent is fully reversible, very stylish and dying to be wrapped around your shoulders. Garter stitch stripes take a new form with a few simple short rows in this striking semi circular design. 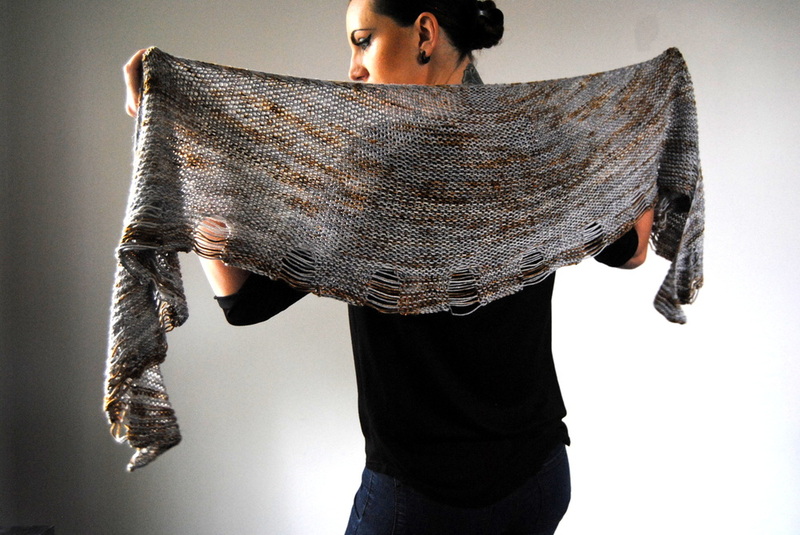 Soft, gauzy curves, deepening in intensity, give this shawl its veil like look. 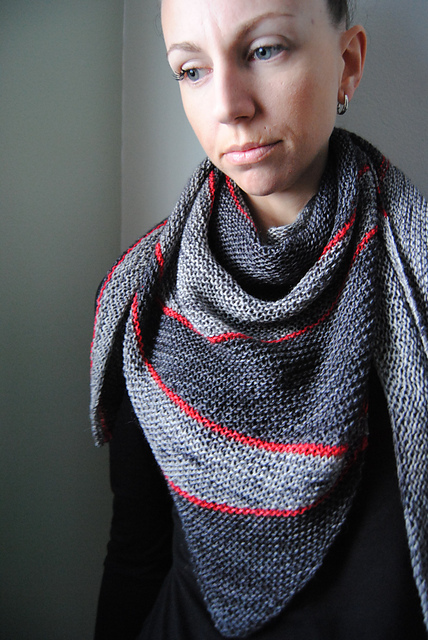 Stripes, short rows, and pointed edge make this asymmetrical shawl a fun and interesting knit. 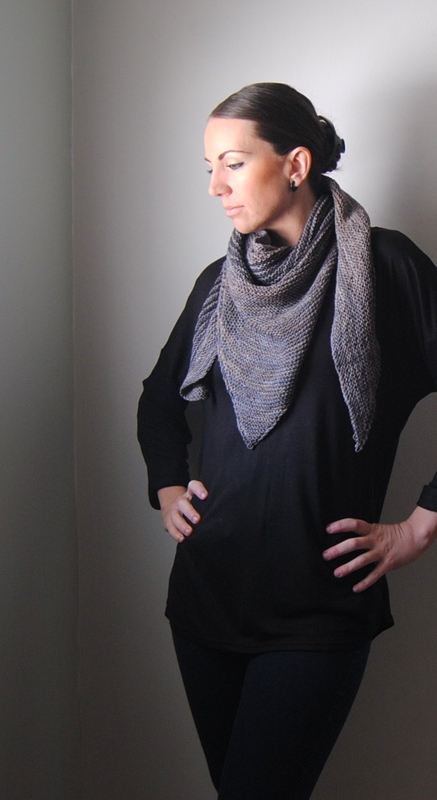 Dramatic and seductive, this triangular shawl features mesh-like lace and contrast stripes. 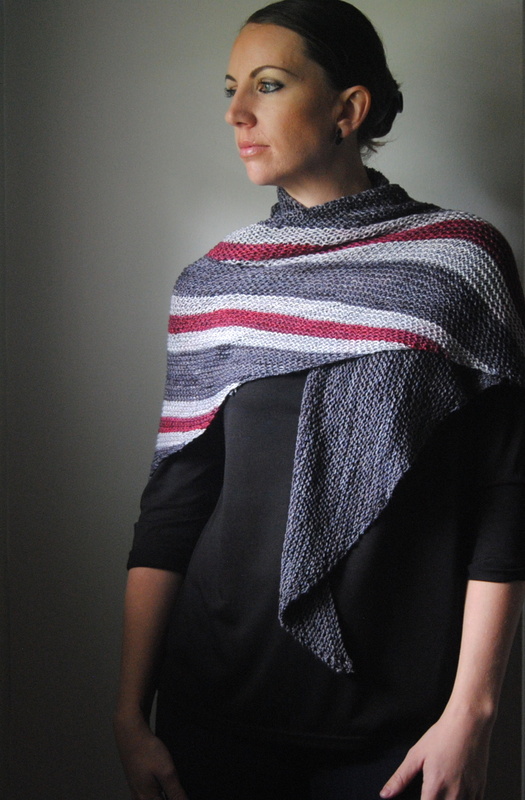 Pick two of your favourite colours to stripe together in this fun semi-circular shawl. Staggered Midnight triangles envelop Fiery in this dramatically wide, V-shaped shawl. 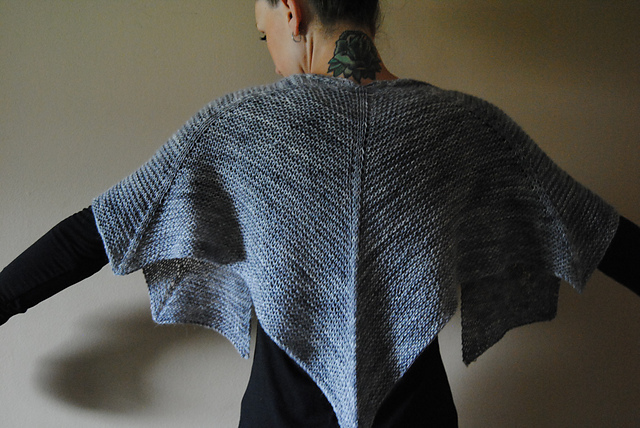 Light, wispy, open, and airy, Wraith is the perfect summer shawl.